party. Usually moms are responsible to plan birthday parties for their kids so we dedicate this posting to moms who are looking forward for ideas to plan their kid’s birthday party. There is a huge different in planning a birthday party for adults and planning a birthday party for kids so moms need to be more selective while making preparations for kids birthday parties. Here is a collection of great ideas to plan a kid’s birthday party that will really make all kids have great fun and praise mom for her preparations. 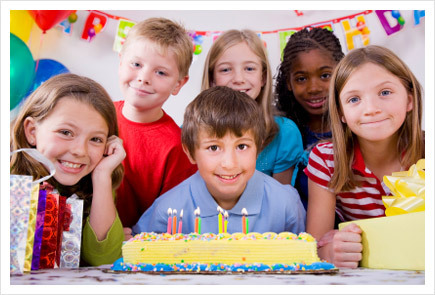 Follow the tips shared below when you plan a birthday party for your kid. Try to choose a fun theme for birthday party and try to make all decorations and other arrangements according to selected theme. You may select a Disney theme, doll house theme, rainbow theme or any cartoon character theme for your kid’s birthday party. Make a guest list and design invitation for all guest kids. Make sure to design invitation in the same theme that you have selected for party so that all kids may get excited to attend your kid’s birthday party when they receive invitation. If you want to send any message to all kids, write it on invitation for instance bring your toys with you etc. Decoration is one of the key arrangements for a kid’s birthday party. Make sure to make all decorations on entrance and in hall where you organize your kid’s birthday party according to selected theme. You may arrange balloons and stuff toys all around the birthday hall. Design a banner with your kid’s picture in theme related dress and hang on a wall. You can also hang picture frames of your kid on a wall in order from his first birthday to the birthday you celebrated last year. Gather best music CDs or cartoons for kids and call all kids to have fun on music or watching cartoons for sometime and do food arrangements when kids are busy in watching cartoons or a kid’s movie like spiderman, harry potter, bad man, super man etc. Ask kids what they want to watch by telling them names of cartoon movies you have at that time. Arrange some toys and games in one corer of the hall where you are going to organize a birthday party. Make sure that there is no breakable or harmful toy. It would work great if you ask guest kids to bring their toys with them and share their toys with each other to have variety. Play a CD of music while kids are busy in playing with toys. Kids consider magic show as a must activity of a birthday party especially arranged for them so you should think of arranging a magic show. Try to do some unique magic with a message that will build kid’s character and make then have fun. Puppet show is also amusing for kids to enjoy so you can arrange a puppet show for kids. First of all you should plan what message to be conveyed through puppet show then prepare puppets and their dialogues accordingly. You may organize this puppet show yourself or call professionals to do this for your kid. You are suggested to keep the food as simple as possible because more of kids don’t have habit to eat without their parents. So make a list of food items that all kids will happily eat and enjoy. You can order cakes, candies, cookies, chocolates and sandwiches for your kid’s birthday party. Don’t forget to arrange party favors for all friends of your kid because they will remember your kid’s birthday till next birthday party if you give them party favors at the end of party. There may be both girls and boys in your kid’s birthday party so arrange favors for neutral gender or hold guest list in your hands to know how many kids are girls and how many are boys to arrange favors accordingly. Don’t forget to arrange some extra favors. Usually soft toys, whistles, clay, stationary items, cards, candies, chocolates are best party favors for kids.